Summer squashes are starting to appear in farmer’s markets (and, in the case of zucchini/courgettes, in my garden!) …so…since they tend to be very prolific and an integral part of weekly farm shares all summer long and are also cheap in supermarkets at this time of year — it is time to start getting good recipes together! Summer squashes — which include yellow squash, also called marrow; yellow crookneck squash; and zucchini, also called courgettes — are pretty good for you according to Self.com, are delicious, and lend themselves to many great dishes, So there is no reason to be sick of them by August or to refuse your neighbors’ offers of extra bounty when they get overwhelmed with what they’ve grown. Don’t peel the squashes; part of the appeel (sic) of this salad is the hint of color! Mind you, I may have fewer than anticipated…some critter, which may or may not be the cutworm, sliced off several of my zucchini flowers before they could produce the magic green wands….grrrrrrr. Today I went for something different – a quickie slaw alternative called remoulade, like the French classic Celeriac remoulade. This one integrates the garden vegetables that most lend themselves to grating. You can mix and match them however you like! 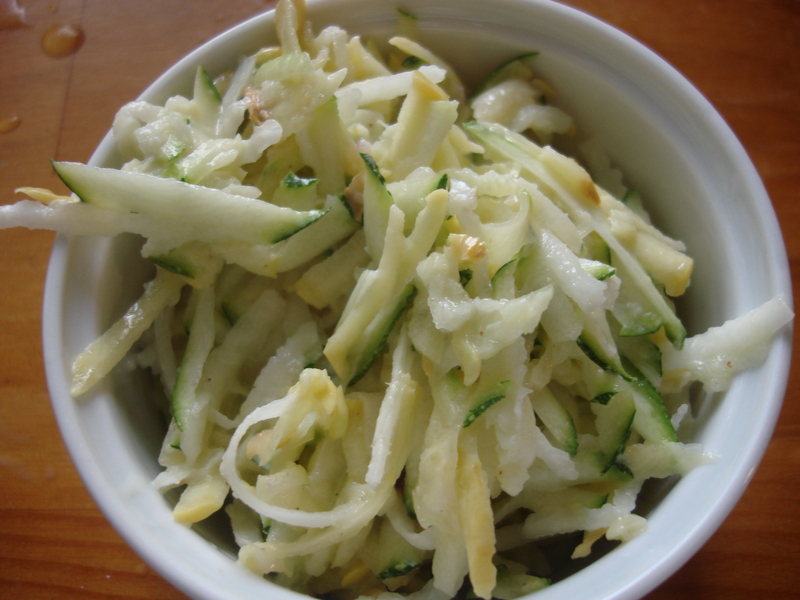 2 Cups mix and match: zucchini/yellow squash/hakurai turnip/mild radish, grated with a large hole grater. Mix all ingredients in a medium bowl. 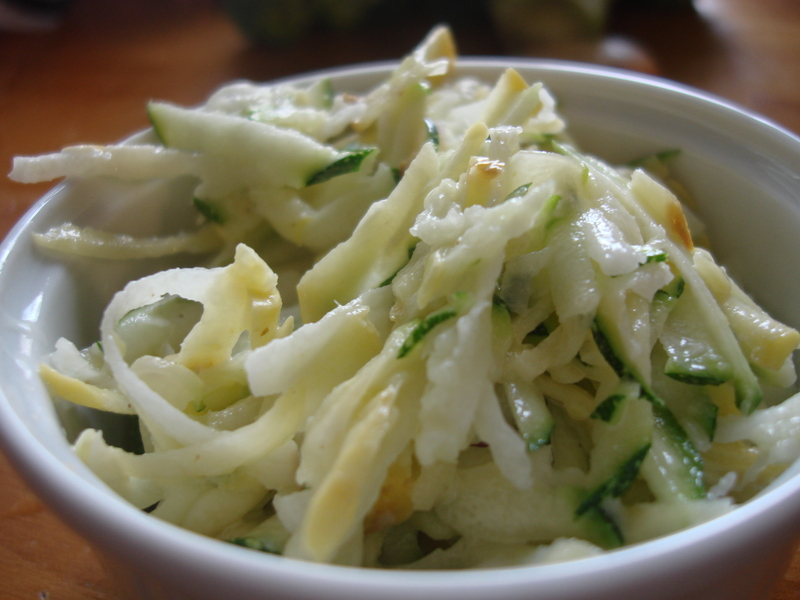 Adjust seasoning to taste and serve as an alternative to cole slaw. *If there will be a lag between grating the vegetables and making the remoulade, add lemon juice to the waiting vegetables to prevent browning.